This year I had the blessing to work with leaders from Lewiston/Auburn to address hate, violence and division in our community. 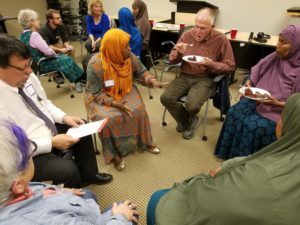 Together, Maine Community Integration, Maine Council of Churches and Maine People’s Resource Center engaged over 250 neighbors from diverse backgrounds to break down stereotypes and barriers to connection in our community. Neighbors spent time hearing the stories of pain and disconnection in our midst, and understanding the gravity of what so many people experience on a daily basis. They learned tools for fighting bias and discrimination in our day-to-day activities, and they found new connections across the cities. Check out Maine Public’s radio segment, and the Sun Journal’s coverage of this dynamic project. UWC NEWSLETTER: We load new tools, tips, and stories each month – sign up for a monthly round-up of what’s jumping at UWC!